We have, as of the last couple of days, had a little bit cooler temperatures and even some snow here in the Willamette Valley. For those of you who do not recall, I am a Mid-Western transplant, and so this “cold” weather and couple of inches we had are far less than what I would be used to for a Mid-Western December. That being said, I came home this afternoon, my university letting us out at 4pm so people could get home before the snow/slush re-froze to create the ice rink that would be the roads of Salem, and decided I need to open a new bottle of wine. I initially thought I would open either a sweet desert wine, Chardonnay, or Pinot Gris – all of which would need to be chilled. So it was decided that a Pinot Noir it would be! A couple of weeks ago, I was finally able to take Josh to King Estate Winery. 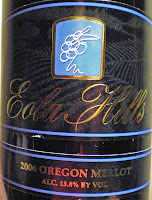 King Estate is located in the southern Willamette Valley about 15 miles Southwest of Eugene. The scenery at King Estate is always one that is relaxing and enjoyable. Depending the time of year though, that view could be obscured with clouds, rain, or fog. That particular Saturday was one that a little cloudy and there had been some fog. It was also late fall, so it was not like I had seen when I was there in September 2007. 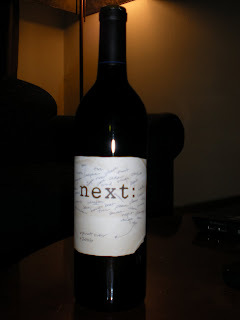 The bottle that I opened this evening was their 2006 Pinot Noir, Next. 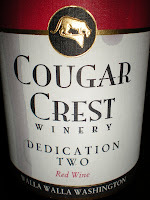 At this time, I have been unable to find out about this line of wine via the internet and my memory of it from before is rather weak. This was not one of the ones Josh and I tasted, but it was one I had had before. I opened the bottle and let it sit for about an hour before I poured the first glass. I took a whiff of the nose initially when I popped the cork to find it oak and spice filled. After an hour of breathing, those scents were only further enhanced. Upon pouring my first glass, as it came out of the bottle, it looked a lot like grape jelly, from the bottle to the glass. After I stopped pouring and looked at my glass, I could see a little more of the red hue, probably due to the cherries and pomegranate. The first couple of sips were strong, warming my throat like a nice cough syrup (I state "nice" because so many of us have a negative thought when it comes to cough syrup). You would notice the spices and oak of this wine, although based on the website, what I think are spices could be the oak char. After a while (I ended up consuming the entire bottle), the flavor continued to be enjoyable. 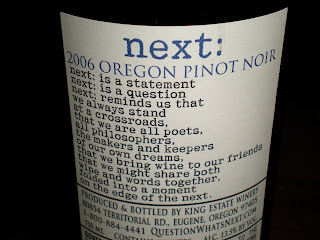 It was rather light, and not heavy that someone may sometimes think of for a Pinot Noir. I did not find the flavor to be overly fruity or oak-filled, but very subtle and relaxing. It was the perfect way to end a nice day filled with snow/ice and "cold."